Farmersgirl Kitchen: A wee bit wet! It's been raining! 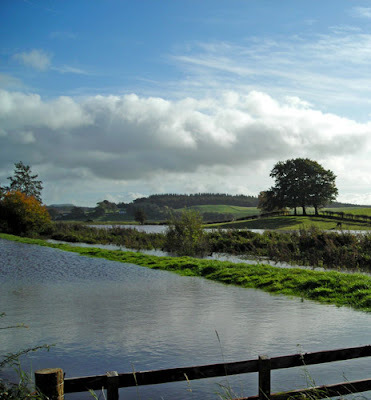 We've had quite a lot of rain this week and yesterday it rained all day, the result being quite a lot of flooding in the fields. This is not an unusual occurance, and we have had much worse floods, as far as I know none of the roads are flooded, but I thought you might be interested to see it. 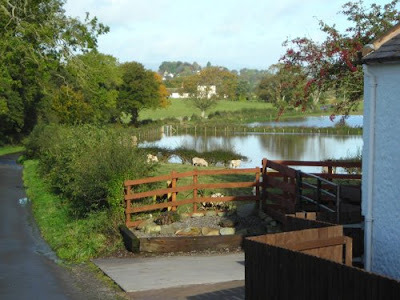 The picture above is the field to the left of the house 'side of the house' field, where we have a large pond and often have wild ducks visiting. 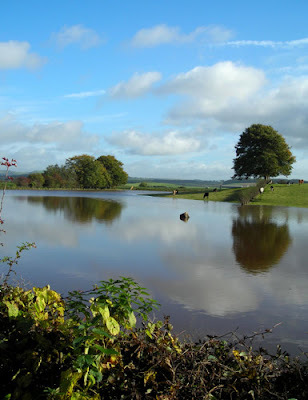 You can see that the weather is much improved this morning and I was pleased to catch this reflection in the flood. This is the middle field and the bottom field (where Brian and Bob got caught in the rain! 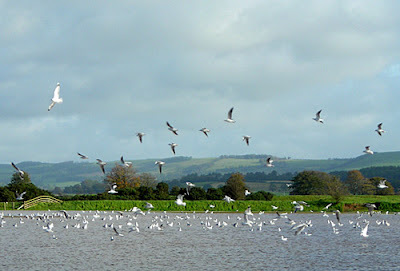 ), these fields run down to the River Annan. This picture is looking back at our fields from the ditch between us and the Bush Farm fields, that's the ditch just behind the strip of green. 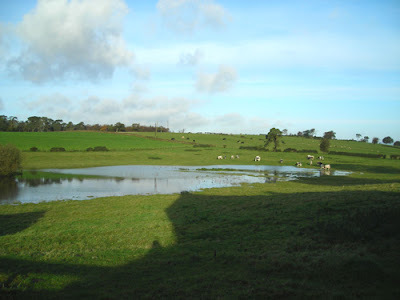 Our neighbour had just ploughed and reseeded this field, so I don't expect he is very happy that it is completely under water. Looking down towards the middle and bottom field from Welldale, that's the cottage on the left. This picture gives you an idea of the extent of the flood, all the low lying ground is covered, that is the Cheese Factory on the horizon to the left of the picture. I'm not sure if all the grass seed had floated to the top of the field, but something had attracted a huge flock of seagulls to this newly reseeded field.